STACK uncovers the unlikely origin of the modern day sports bra. The first sports bra did not come on the market until the mid 1970's. According to Deadspin.com,Â Glamorise Foundations introduced the "Free Swing Tennis Bra" in 1975, the first commercially available bra marketed for "active" women, branded as "on-the-go." But it looks more like a regular underwire bra, or lingerie, than a contemporary sports bra. Around the same time, University of Vermont grad student and casual jogger Lisa Lindahl started wearing two bras, one a size too small so it would be tighter. Lindahl's sister, also a jogger, complained to Lisa about her bra troublesâloose straps, chafing and soreness. Lindahl enlisted the help of local costume designer Polly Smith to create a solution: a bra with straps that would hold, fasteners that wouldn't rub against the skin, and a structure that would provide adequate support during exercise. The first sports bra did not come on the market until the mid 1970's. 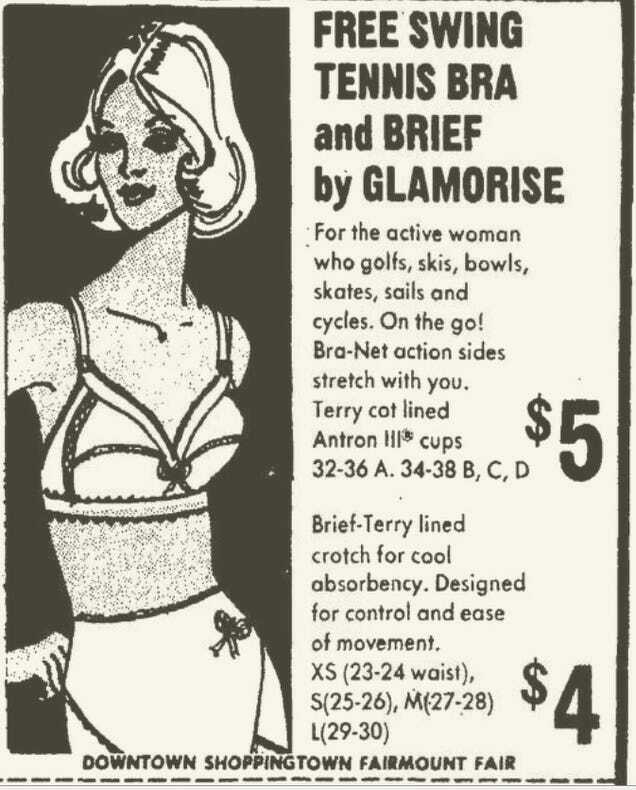 According to Deadspin.com, Glamorise Foundations introduced the "Free Swing Tennis Bra" in 1975, the first commercially available bra marketed for "active" women, branded as "on-the-go." But it looks more like a regular underwire bra, or lingerie, than a contemporary sports bra. Around the same time, University of Vermont grad student and casual jogger Lisa Lindahl started wearing two bras, one a size too small so it would be tighter. Lindahl's sister, also a jogger, complained to Lisa about her bra troubles—loose straps, chafing and soreness. Lindahl enlisted the help of local costume designer Polly Smith to create a solution: a bra with straps that would hold, fasteners that wouldn't rub against the skin, and a structure that would provide adequate support during exercise. During the design process, the duo joked about how they essentially needed a jock strap for their chests, reported Greatist.com. It wasn't until Lindahl's husband jokingly strapped an upside down jock strap to his chest that the idea was born. Lindahl and Smith sewed two jock straps together and voila! the first true sports bra. At first it was to be called a "jockbra," but it was quickly renamed "jog bra." Their original 1979 patent does not include jockstraps, but it does feature the same kind of elastic band for support and crossing back straps that we commonly see today.